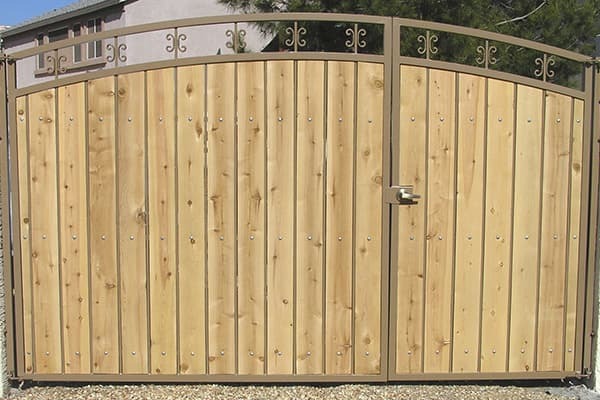 Sun King Fencing & Gates is Phoenix's trusted manufacturer and installer of iron and wood gates. Call 602-989-0839 to discuss a solution for your home or business. Enjoy the best of both iron and wood for your custom gate. 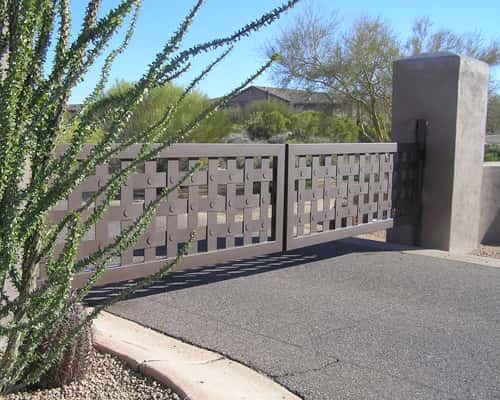 With the extreme temperatures and heat that we endure during the summer months in Phoenix, Sun King Fencing & Gates offers wrought iron and composite wood gates as well as wrought iron and real wood gates. These gates use a composite material that gives the appearance of wood, yet is much more durable and is maintenance free. Wrought iron and composite gates are excellent when used as RV gates, backyard access gates, and in commercial applications. Through the use of high-quality iron, we can manufacture a wrought iron and composite wood gate that provides excellent security and looks extremely attractive. 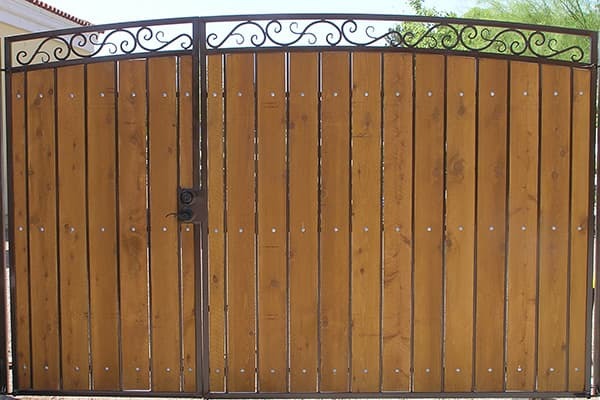 Iron and real wood gates are also available with natural, stained and sealed, or clear coated "real wood gates." We manufacture all of our wrought iron and composite wood gates at our plant in Mesa, Arizona. 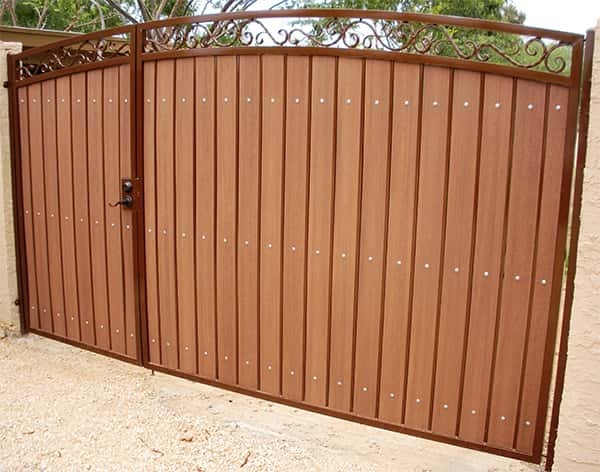 At Sun King Fencing & Gates, we manufacture each wrought iron and composite gate from bulk steel and optional composite wood and composite gate from scratch. Using steel and composite privacy slats, each wrought iron and composite wood gate is manufactured to your exact specifications. 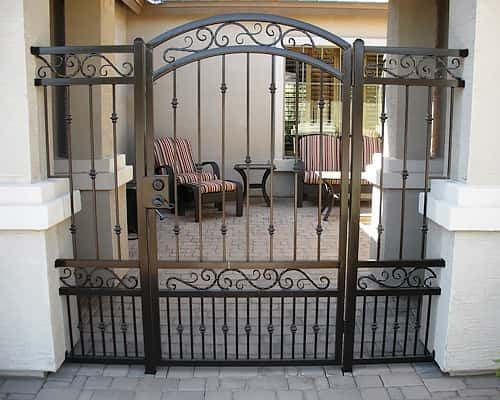 Our wrought iron gate and composite designers will come to your home or business and work with you to develop a gate that meets you specific needs. We use no prefabricated gates. We can custom-build a gate for nearly any opening size. We use high quality steel that is fabricated for your specific application. We first apply an epoxy-based primer with an electrostatic paint gun in our paint booth. Next we apply an environmentally safe polyurethane paint in the color of your choice. The polyurethane paint puts a plastic-like coating on the iron giving it a hard outer shell. 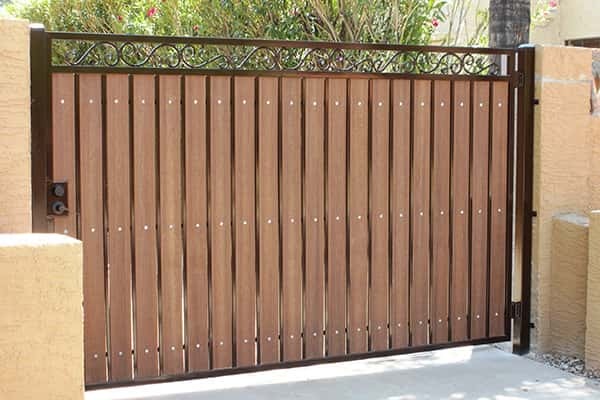 After all of the wrought iron is prepared, we will insert the composite or wood privacy slats. A wrought iron and composite wood gate serves a variety of functions. Choose from our selection of decorative styles and functional features. Looking to add a gate to your home or business? We can guide you to the perfect solution. We are a licensed, bonded and a registered contractor so that you can be assured of a professional service. At Sun King Fencing & Gates, we pride ourselves on providing timely estimates for your wrought iron and composite wood gates. Plus, each estimate can be adjusted or modified to meet your specific needs and budget. To find out how we can help you, give us a call at 602-989-0839 or send us an email using the provided contact form. We look forward to designing and installing a custom wrought iron and composite wood gate that meets your exact needs and that you'll love for years to come. 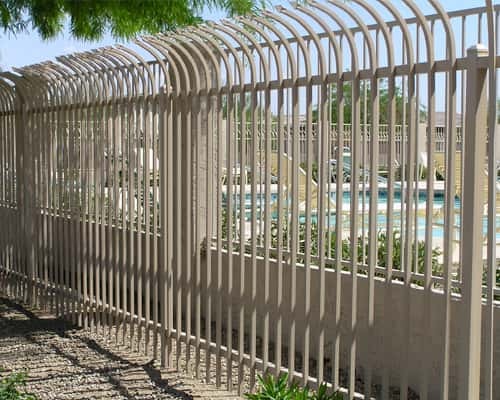 We proudly serves the communities of Apache Junction, Cave Creek, Fountain Hills, Gilbert, Chandler, Mesa, Paradise Valley, Phoenix, Queen Creek, San Tan Valley, Scottsdale and Tempe with high-quality wrought iron fencing and gates. Call us today and see how we can improve the look and safety of your home or business.